The Arthur L. Johnson Athletic Department recently held a breakfast in honor of the 2018 Fall Athletics G.P.A. Challenge winners, the Crusader Field Hockey Team. The event, sponsored by the Athletic Department, was held in the ALJ cafeteria. The Crusader G.P.A. Challenge is awarded each season to the team that finishes with the highest overall G.P.A. amongst athletic teams seasonally. They were presented with certificates, had their team memorialized on a plaque, and were invited for a “Breakfast with the A.D.” to celebrate their actions both in the classrooms and on the courts. The Field Hockey Team, with a G.P.A. of 4.0198, was the 2018 Fall G.P.A. Challenge winner. Members of the Field Hockey Team include: Alyssa Colicchio, Nina Couzzi, Sabrina Diwane, Victoria Marano, Kaylee Parkhill, Alley Renda, Amanda Zambrana, Heidi Compton, Emma Hilton, Nicole Randazza, Tara Starita, Taylor Turek, Jordyn Walsh, Devyn Calas, Gianna Caldiero, Gia Colicchio, Michelle Kukan, Courtney Marano, Victoria Venezio, Peyton Collings and Tatum Dobbins. 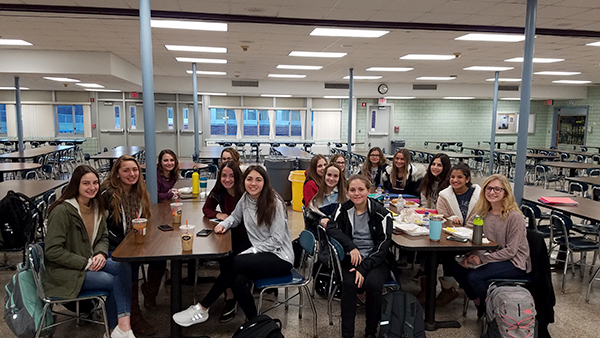 (above) The Field Hockey Team enjoys breakfast as a reward for winning the 2018 Fall G.P.A. Challenge.